Chinese state television has broadcast the first clear, overhead view of the Chinese navy’s first Type 055 cruiser. The image confirms what foreign analysts have expected since the new cruiser began taking shape in 2014. The Type 055 carries no fewer than 122 missiles in vertical cells — any mix of anti-air, anti-ship and land-attack models. That matches the weapons-loadout of the U.S. Navy’s Ticonderoga-class cruisers … and exceeds the armament of every other surface warship in the Pacific region. The new cruiser could enter service as early as 2018. The Type 055 — which is an estimate 590 feet long and displaces at least 10,000 tons — represents a new class of warship for the Chinese navy. When Beijing launched its naval rearmament program in the 1990s, it focused on building large numbers of small- and medium-size corvettes, frigates and destroyers. These surface vessels patrol the Chinese coast, sail independently or in small groups to deter pirates in the Indian Ocean or act as escorts for China’s new amphibious assault ships and the country’s — so far — sole aircraft carrier, the refurbished, ex-Russian Liaoning. Prior to the Type 055, the biggest surface combatant in the Chinese fleet was the 7,500-ton-displacement Type o52D destroyer, six of which were in service and several others fitting out as of October 2017. A Type 052D carries 64 missiles in vertical cells. For comparison, the U.S. Navy’s 9,600-ton Arleigh Burke-class destroyers boast as many as 96 missile cells. Japan’s Atago-class destroyers, displacing 10,000 tons, also feature 96 cells. The 11,500-ton Russian cruiser Varyag, the biggest vessel in Moscow’s Pacific fleet, carries 120 missiles. With the Type 055, China has caught up to, or surpassed, the other Pacific powers in terms of sheer seagoing firepower. Per ship. But the Chinese fleet still lags behind the United States and barely exceeds Japan in the overall number of seagoing vertical missile cells, a useful shorthand for naval power. China’s 39 modern destroyers and frigates — not counting the Type 055 — together can deploy around 1,500 cells. 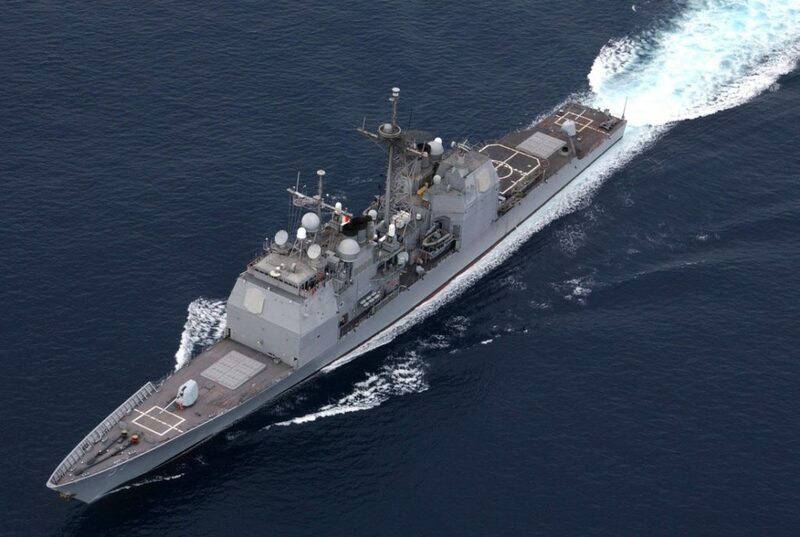 The U.S. Pacific Fleet’s 36 Burkes and 12 Ticonderogas together possess nearly 5,000 missile cells. Japan’s 19 modern destroyers carry around 1,000 cells, combined.